Over the last several weeks we've been discussing various components within Adobe Photoshop Lightroom 3 by stepping through my own workflow process. Last week we reviewed how Collections can help keep your photo catalog organized. This week we'll begin to look at the power of "keywording". I process the contents of my memory card after every shoot. I find it easier to keyword all the images that are left in the special "Previous Import" collection while they're still together and not scattered through various other collections. Note: Check out the Smart Collection "Without Keywords" to find images you've yet to keyword. Usually I'm going to have multiple images of the same subject matter from the shoot so I can quickly select multiple images and apply the same keywords at one time. 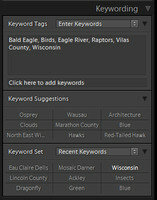 Keyword Text Box (showing "Bald Eagle", "Birds", etc in screen shot) - This field shows keywords that have been added to the image. You can type keywords into this field directly, separated by commas. Add Keyword Text Box (showing "Click here to add keywords") - Works the same as the larger text box except after adding a word and pressing enter, the added word appears in the Keyword text box and the field is cleared and ready for the addition of another field. You will notice as you start typing in either of the text box controls, Lightroom attempts to match your entry with existing words found in your keyword list. Keyword Suggestions - A rather powerful "dynamic" list of keywords that changes based on the keywords you've already added to the selected image. Lightroom checks the images in your catalog that contain the same keywords and displays other keywords those previously tagged images contained. Just click on the word to add it to the Keyword Text Box. Keyword Set - I confess I don't use this option much. The concept is you can create "sets" of keywords that would contain commonly used tags for various types of photography. For example, you might have a Keyword Set for "Landscape" that contains keywords commonly found in landscape images and another Keyword Set for "Wedding" which would likely contain an entirely different grouping of tags. When I first began using Lightroom I used the options in the Keywording Panel to tag my images. When you add a keyword to an image, that keyword is also added to your Keyword List. It doesn't take long before you have hundreds or thousands of tags in your Keyword List all jumbled together. It was during this realization that I stopped using the above options to keyword my images. Instead, I discovered the power of the Keyword List Panel. Come back next week when we'll discuss how to unleash the Keyword List Panel and why I find it such a better tool for keywording.